Materials: Allen S402BL 6-12, UTC 140 Brown, 3.8mm Copper Tungsten Bead, .020 Lead-Free Wire, Gold Wire, Spirit River Mottlebou Brown, Krystal Flash Gold, Brown Flex-Floss or Spanflex, Rooster Saddle Natural Ginger, Arizona Simi Seal Brown/Brick. Place the tungsten bead on the hook and wrap enough lead to cover 2/3 of the hook shank when pushed into the bead. Secure the lead to the hook and wrap back to the bend of the hook. 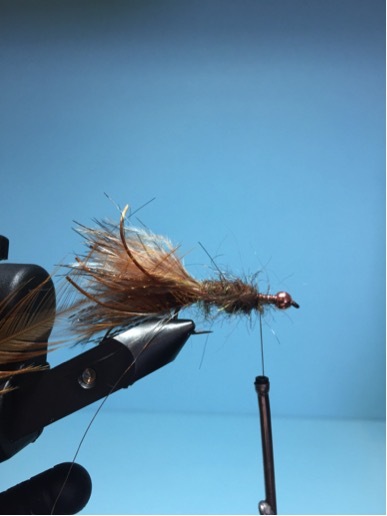 Tie in the marabou so that it’s roughly measures one hook length. Tie in 5 or so strands of Krystal Flash on both sides of the marabou. Trim the strands so they are the same length as the marabou. Tie in 3 or so Flex-Floss or Spanflex legs on both sides. Measure them so that they are just a tad longer than the marabou. Tie in the gold wire and a saddle hackle feather by the tip. Generously dub the Simi Seal in a counter clockwise direction on to your thread. Wrap you dubbing weenie forward until you have covered 2/3 of the hook shank. Use Velcro or a dubbing brush to tease out the dubbing and bush it and the saddle hackle backwards. Generously dub up to the bead from where you tie in the legs. You want quite a bit of dubbing in this step so that you can tease out a good amount. Tease out the dubbing and brush it back. Whip finish and you are done. Tie this one up in numerous colors and drift, swing or strip it. I find this color scheme along with black, olive, cream and purple to be the most effective.